If one is Protestant there are certain scriptures he cannot fulfill. This is not because he doesn’t understand them, or is not morally or spiritually fit enough to fulfill them, but simply because he is Protestant. The first one is when the Apostle Paul tells us to be of one mind with each other (cf. 1 Cor. 1:10, and 2 Cor. 13:11). How in the world with all of the various denominations, and all of their various doctrinal statements, can Protestants be of one mind with one another? When confronted with this Protestants will normally resort to claiming that there are primary doctrines which affect our salvation and secondary ones which do not. They then say that they are of one mind on the primary ones and so fulfill the scriptural command. The problem is that there is no scripture in the New Testament which says that there is such a thing as primary and secondary doctrines. So in an attempt to follow one scriptural command, they invent that which is not scriptural, all the while claiming to be a religion based on the scriptures. Another scripture which one cannot fulfill if one is Protestant is 2 Thess. 2:15, which tells us to follow an oral tradition that has come down from the Apostles. Most Protestants reject tradition all together, much less an oral one. They cite the telephone game as evidence that it is sure to become corrupted over time. A combination of this unbelief, and the fact that Protestantism didn’t begin until the 1500s, precludes them from having an Apostolic oral tradition, and therefore prohibits them from fulfilling this scripture. Finally 1 Tim. 3:15 says that the Church is the pillar and ground of truth. This gives every indication that we should be able to look to the Church for the truth. The question one must answer if one is Protestant is which church does one look to for this truth? There are so many different churches with so many different doctrinal statements, that the idea of having something called “the Church” in Protestantism is ludicrous, much less obtaining one consistent truth from it. To counter this, Protestants have declared the scriptures to be the pillar and ground of truth, while they believe that the church is profitable for various things. The problem is that the Bible actually says the opposite. It says that the scriptures are profitable (2 Tim. 3:15-17) and the Church is the pillar and ground of truth. In this case Protestants actually reverse the scriptures in order to justify remaining Protestant. The mere presence of denominations is the most obviously unscriptural aspect of Protestantism. 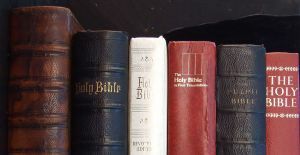 One will search the New Testament in vain trying to find anything that justifies Christianity breaking up into many different sects with many different doctrinal statements. Of course there were heretics from the beginning, but they were able to be combated by the Church because no matter where it went in the world it took the same doctrinal statements with it. Peter, Paul, John, Matthew etc. all preached the same thing. Can modern day Protestants say the same? If one is Protestant and wants to remain so, he must ignore some scriptures while inventing others, somehow justify unscripturally dividing into many different sects, all the while claiming to be the expression of Christianity which is the most scriptural. This seems like a lot of mental gymnastics just to remain Protestant.